There are few things finer in the creative arts than a project that is totally unexpected but in hindsight makes perfect sense, like the end of a really good novel. 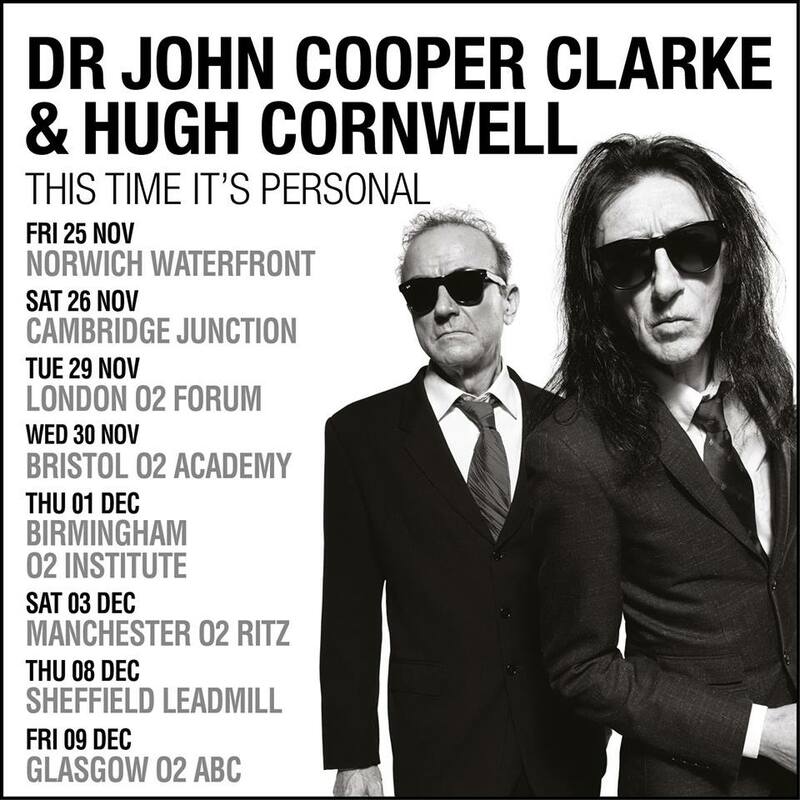 The album This Time It’s Personal (Sony 2016) is one of those projects, a musical collaboration between the godfather of performance poetry, Dr. John Cooper Clarke, and legendary guitarist, singer/songwriter and author, Hugh Cornwell, the original Guildford Strangler, a cultural event as modest as it is huge. For me, this is about the only good thing to come out of this miserable year, and my family is presently deploying it as a talisman to ward off the multiplying villanies of nature that do swarm upon us. As soon as the tour dates were announced we bought our tickets, and Gracie and I caught the first show at The Waterfront in Norwich on Friday. Skint as I am, I wouldn’t have missed it for the world. Gracie had never seen either of these guys before, and you can read her eloquent account of the experience here. We bought the CD at the gig – signed – and it has not left her car stereo since, drawing some quite bemused looks from the locals. We bought the vinyl as well; sometimes, you have to have both, just to be on the safe side. Leaving aside re-issues, rarities and compilations, this is Clarkie’s first new studio album since Zip Style Method in 1982, and was apparently conceived by Cornwell after listening to that contentious and rambling piece of baroque psychedelia ‘MacArthur Park’ by Richard Harris and wondering what it might be like if the Bard of Salford sang it. He approached his friend with the idea, which grew into an album of cover versions of much-loved songs from their youth, with Hugh on guitar and Johnny on vocals, paying their respects and paying their dues to the words and music that had inspired them at the birth of rock ’n’ roll to make the words and music that inspired my generation at the birth of punk. Pretty high concept, ’eh? Already you can sense that weird inevitability. ‘MacArthur Park’ is as much a lyric poem set to music as it is a ‘song.’ As a pop song, it’s downright unconventional, with complex imagery and elaborate melodies, a running time of seven-and-a-half minutes, and a theatrical delivery by Richard Harris, fresh from Camelot, somewhere between musical theatre and spoken word. Conceptually, there’s not much to compare it to in the popular music of the period aside from Dylan’s ‘Desolation Row’ and ‘Hey, Jude’ by The Beatles, songs so long the DJ could nip home and feed the dog and be back in the studio before the track had ended. To this day, critical opinion remains divided as to whether Harris’s Shatneresque delivery and composer Jimmy Webb’s eulogy to lost love and baking metaphors is a work of profound and subtle genius or one of the worst records of the decade. Personally, I always f—ing hated it, at least until now. But love it or loathe it, who better that the writer of ‘Beasley Street’ to interpret the labyrinthine structure of Jimmy Webb’s flawed masterpiece? Clarke’s influential hymn to urban decay is another long poem (also about seven minutes), originally set to music by Martin Hannett’s Invisible Girls in 1980, and the poet himself is a seasoned performer of his own work, his powerful voice instantly recognisable, unashamedly northern and working class, Salford through and through. 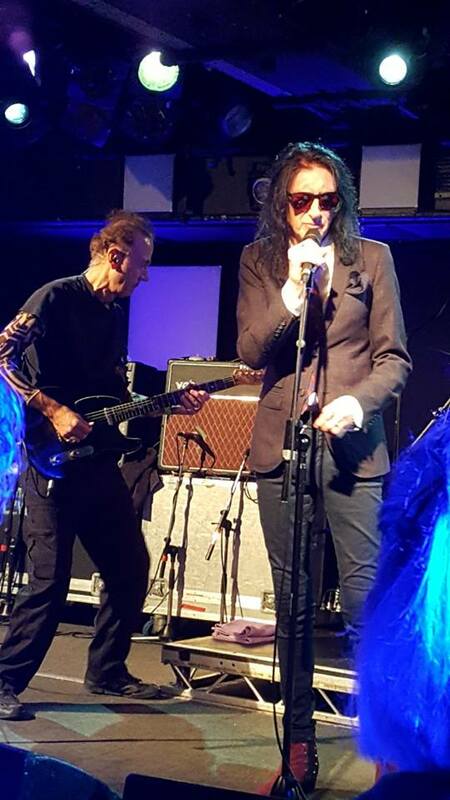 Hugh Cornwell, meanwhile, is a meticulous musician and producer, and an equally thoughtful lyricist, and both men are icons of punk rock, the last cultural revolution after the fifties and sixties, Elvis and The Beatles. Cornwell had also already memorably arranged and covered three classic singles from the sixties with The Stranglers: ‘Walk On By,’ ‘96 Tears’ and ‘All Day and All of the Night.’ When you think it through, the only real surprise is that they didn’t come up with this sooner. ‘It’s Only Make Believe’ by Conway Twitty (1958) written by Jack Nance and Conway Twitty. ‘Way Down Yonder in New Orleans’ by Freddy Cannon (1959) music by John Turner Layton, Jr. and lyrics by Henry Creamer (first published in 1922). ‘Spanish Harlem’ by Ben E. King (1960) written by Jerry Leiber and Phil Spector, and produced by Leiber and Mike Stoller. ‘Johnny Remember Me’ by John Leyton and the Outlaws (1961) written by Geoff Goddard and produced by Joe Meek. ‘MacArthur Park’ by Richard Harris (1968) written and composed by Jimmy Webb. ‘She’s a Woman’ (originally ‘I’m a Woman’) by Christine Kittrell (followed by Peggy Lee, both 1962) written by Leiber and Stoller. ‘Donna,’ written and performed by Ritchie Valens (1958). ‘Jezebel’ by Frankie Laine with the Norman Luboff Choir and Mitch Miller and his Orchestra (1951) written by Wayne Shanklin. ‘Love Potion No. 9’ by The Clovers (1959) written by Leiber and Stoller. ‘Sweeter Than You’ by Ricky Nelson (1959) written by Baker Knight. To hear the guys discussing these tracks click here. I f—ing love John Cooper Clarke. He’s one of those heroes I was writing about last year when we went to see Public Image Limited. Hugh Cornwell is another. I encountered both in 1977, a very good year. The Stranglers broke big. Rattus Norvegicus and No More Heroes both came out that year, and they charted with a string of deep, dark and pounding singles, all of which I still own. Unlike a lot of the three-chord, dadaist punks, they’d honed their act on the R&B pub circuit and had a lyrical and musical sophistication that a lot of the other bands caught up in the new wave lacked. I loved that whole sleazy ‘men in black’ style, the energy and the words. I saw them play live two or three times. I think the first time was at UEA but my friend Martin reckons St. Andrew’s Hall – I don’t remember to be honest, although I do remember Jean-Jacques Burnel jumping off-stage mid-song and twatting someone in the audience. The last time definitely was UEA, the Dreamtime tour in 1986; thirty years ago, wow. I lost interest when Cornwell left. Let’s face it, he was The Stranglers. Looks like they brought back hanging for everyone. They’re gonna bring back the rope for everyone. I worked with Andrew Motion at UEA, and take it from me JCC would’ve made a much better Poet Laureate. I’ve seen him perform his work every chance I’ve got, from those early punk gigs to art centers, through the weirdness of the eighties (he was at the first Glastonbury Festival I ever broke into in 1982), when you never really knew what you were going to get – including forgotten lines and aggression or an hour of classic northern stand-up – to the return to form in the nineties and noughties, one time supporting The Fall, although I’m ashamed to say I’d not seen him and Mike Garry together before Friday. It has always been a pleasure, and last Friday was no exception, the experience enhanced because this time I got to share it with our Gracie. Norwich is one of those places where concert tours tend to start. It’s an artsy city; not too big, not too small, and about a hundred miles from London, with medium-sized university venues ideal for testing out a stage show. This year, for example, we saw The Goo Goo Dolls and The Sisters of Mercy both kick off tours here, and as far as I know this was the first public performance of This Time It’s Personal. The Waterfront is a relatively small, intimate venue, and a good place for poets. The turn-out was not initially very impressive, and I was fretting about the lack of respect shown until the place filled up a bit. For some reason, the doors were opened ridiculously early, so the crowd kind of trickled. We had a couple of drinks, bought some merch (I went in determined to get a signed LP), and choose a good spot down the front, listening to the PA playing classic from the fifties and sixties introduced by Clarke himself, the perfect DJ. 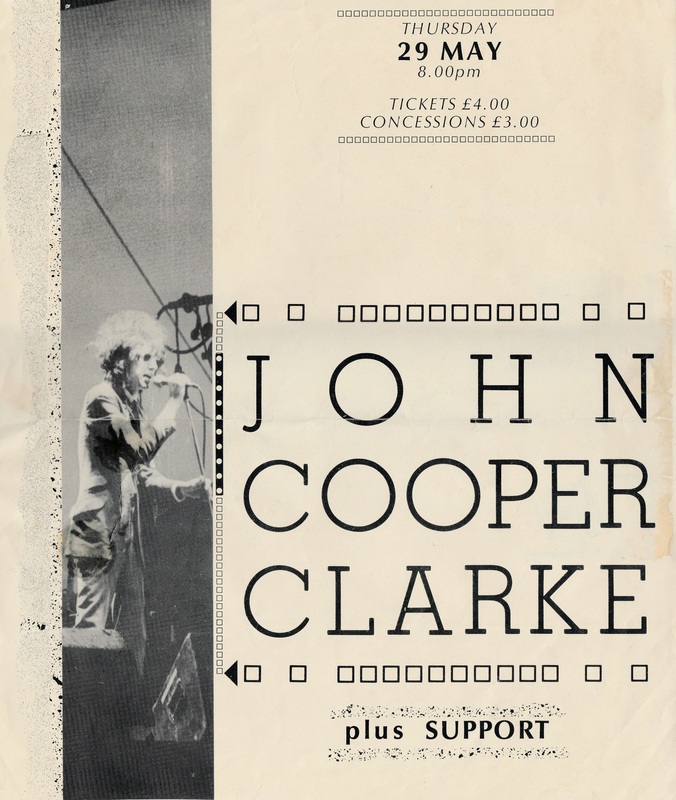 Garry warmed us up, his beautifully delivered and resonant poetry providing the spoken word component so essential to any John Cooper Clarke appearance, and the two have been performing together for the last five or six years. In the interval, Gracie rushed off to buy a book and have a chat about the homeland. Then it was the main event, which we figured would just be a straight performance of the new album. Suddenly there were loads of people there, old punks and baby boomers, people I recognized from the eighties – the seventies, sometimes – raising the roof, sharing the love. Normally, when I go to The Waterfront, I leave feeling as if I’ve been beaten up, my head aching and my ears ringing. (The Buzzcocks deafened me for days last month.) Not so this time. Cornwell and his band had got the sound just right; clear and clean. 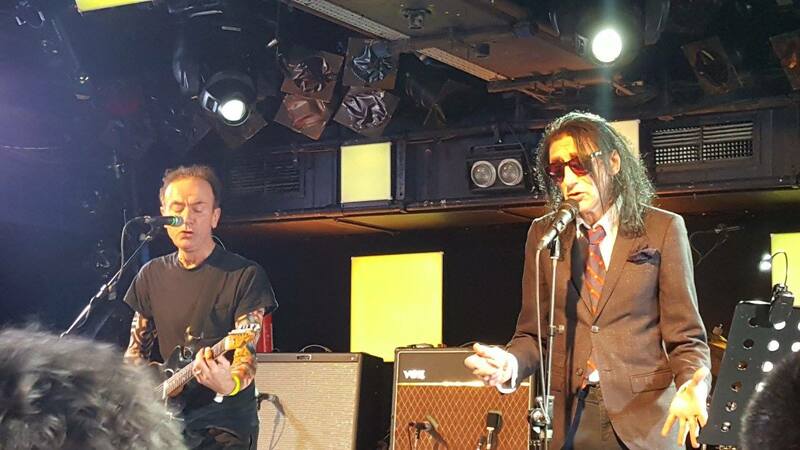 The first couple of songs were tight, Clarkie hitting the high notes on the slow burning and deceptively wide vocal range of ‘It’s Only Make Believe,’ looking like he always does, mad hair, shades, spidery limbs, suit and tie, drainpipes and winkle-pickers, looking very focused. And he can sing. I was reminded of Billy Fury as ‘Stormy Tempest’ in That’ll Be The Day, banging out the classics in a northern holiday camp with Keith Moon on drums… After he’s got the exuberant ‘Way Down Yonder in New Orleans’ by Freddy Cannon under his belt you can see him begin to relax into it, and that incandescent smile of his lights up the stage and he starts engaging with the audience in that way only he can do, that charming, surreal wit: ‘That was “Jezebel” by Frankie Laine,’ says he, ‘his tribute to the Whore of Babylon…’ He nails ‘Johnny Remember Me,’ bringing what has become an oft-murdered rockabilly standard back to the original by John Leyton, with that British Elvis twang, and now everyone’s dancing, and then apologizes for not having Richard Harris’ operatic tones before owning MacArthur Park, complemented by Cornwell’s sumptuous arrangement. I will never think of that bloody song the same way again, it’s meaning changed forever by this new interpretation, an example of T.S. Eliot’s thesis in ‘Tradition and the Individual Talent’ in action. Like a fifties album, it was over far too quickly, but no less glorious for all that, Ricky Nelson’s ballad ‘Sweeter Than You’ ending the set like a kiss and a prayer. And finally it’s over, and you know this was one of those truly great live music experiences, one you’ll remember, one you’ll always be proud to have been a part of. ‘We’ll do this again,’ says Clarkie, bowing out. I f—ing hope so, mate, I really do.